An electric generator must be stopped in a certain way in order to ensure its continued service. This post provides information on how to turn off a power generator. Except in an emergency shut down, the procedure below should always be followed when you want to stop your generator. The first thing to do is to isolate generator from the load. This you do by first switching the transfer switch to the neutral position or/and removing connector from panel receptacle. Never shut down an electric generator loaded except in an emergency situation. You turn of the engine by simply switching the engine to the off position using the switch on the generator. For electric start (key start) generators, you turn off the engine by moving the key anti-clockwise until you get to the 9 O’ Clock position. This can also be step two if you prefer. Just close the fuel valve to stop fuel from getting into the carburetor. To turn off your generator in an emergency situation simply switch the engine switch off. This is the only scenario where you turn off your generator without following the procedure shown here religiously. Always ensure you start or stop your electric generator using the correct procedure. This is not a replacement for your generator manual. 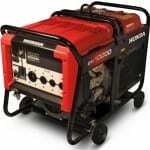 Always consult your generator manual for more accurate information on how to turn on or turn off your generator.